Blog Quick Quotes: 2013 New Release - Stowaway! 2013 New Release - Stowaway! Are you ready for some more new, awe-inspiring 2013 Releases from Quick Quotes? Quick Quotes Scrapbook Company is rolling out complete collections including 6x6 paper pads, cardstock weight papers, quote bundles, wire bound mini albums, chipboard die cuts and stickers. Originally known for our premier kits, classes, Club Q and Private Reserve Educational Extravaganzas, we've taken our designs to the next step! We are so excited to introduce to you the enhanced Stowaway collection! Based on our best selling By the Bay paper collection, Stowaway creates a calm and serene setting for all photos. Reflect on your travels, family, heritage and the list goes on. Tell us what you think! One lucky commenter will win a bundle of our all new quotes. Stay tuned for more sneak peeks coming soon!!! This is gorgeous!!! Love the color palette and the romantic feel of this collection. Now this collection I love! <3 these colors are more me....I'm not very bold LOL Oh and the mini album....so many ideas! OOOO! Blues, browns and a touch of pick. Nice! This is definitely a favorite for me!!! The blues and browns are amazing together!! Loving the kraft mini album. Beautiful! Omigosh! These are sooooo MY colors! an't wait! This is a very 'calming' palette. I love it! Love the soft colors to this collection, and I spy another mini album!!!! Beautiful color scheme and I really love that mini album! The paper has a dreamy quality to it! Love it. Very nice color combo ....romance and rustic ....I love it !! Thanks for seek . I can't wait for it to hit the stores . I like the wired mini album. But I love the colors of this line of paper, just love them. Love the colors, can't wait. I love the blues! And the best in every collection are the quotes and phrases! Beautiful colours!! So glad you're one of the expanding companies - love QQ stuff!! You are rocking the new lines in 2013! I love the blues and browns, it is one of my favorite color combos. LOVE this collection! Very pretty color combination that will be very versitile! The colors are so soft. I really like the sentiments. Loved this line from the start and I am so pleased to see more being added to it! Gorgeous and relaxing and fabulous collection. Be so fun to work with. Love it. This new line is gorgeous! Also can't wait to see the kits and projects you guys put together with this line! Wow those colors are amazing together! Love it...thanks for the chance to win! Love the colors. So soothing. I absolutely love these colors and the subtle patterns (especially the gingham). You are so right that this collection will work for just about everything. I have always been a huge fan of Quick Quotes. I love the classes, products and of course Club Q. This line is amazing and I can't wait to use it! Love the teal and brown. Beautiful colors and the album is really cute! Thank you for a chance to win! I am super excited for the albums and 6x6 paper pads. And these colors are great. Thanks! This would be perfect for my cruise pictures. So, when can I have it? I went on my cruise over a year ago and have been searching for the right stuff for it. Love the paper with the pink flourishes at the edges. Oh BTW, did I mention I LOVE IT??!!! Great color combo and I love the album cover! I the love the softness of two of my favorite colors. Love the colors in this collection. The beach and all the fun of summer is calling me. The color on these papers is very pretty !! And I love the coordinating album !!! The Stowaway collection would be so amazing to use. 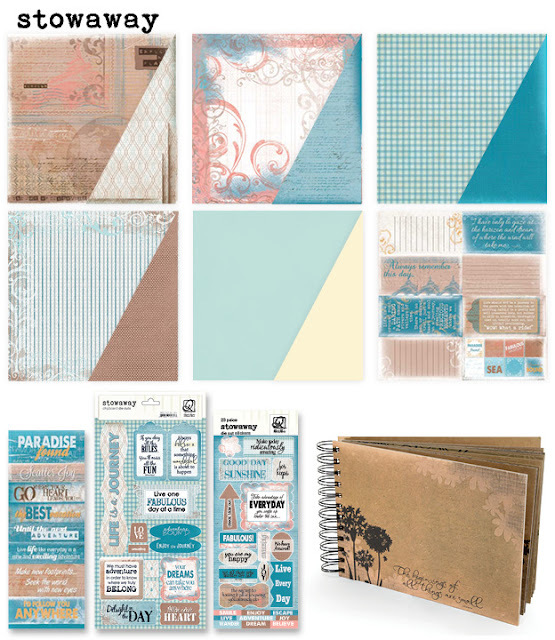 I have just started working with distress ink so using the Stowaway collection with the distress ink would be perfect together. That album is sooooo cute!! Love it. Love the collection, especially the album. Love the color of the papers! And the spiral album. Love the kraft paaper mini album.